The greens I’m using here are broccoli di rapa, but you could use any bitter greens, such as dandelion or escarole. In order to heighten the bitterness of the greens, I’ve sauteed the broccoli raw, the way my mother does it–no pre-blanching. This accentuates the bitterness of the greens and actually makes them taste like an entirely different vegetable than when they’re blanched then sauteed. The reason I want the greens to be extra-bitter is because the polenta is so luscious and neutral that it acts as a wonderful foil for the greens–much like a piece of bruschetta. The polenta has been cooked, then allowed to solidify (which it does very quickly as soon as it begins to cool down), then sliced and fried. Therefore, you could make a batch of polenta days ahead and leave it in the fridge as a solid block. Use much like bread–cut a few slices at a time and toast under the broiler or pan-fry in olive oil, then top with just about anything moist or melty (gorgonzola is especially decadent). Finally, ricotta salata is the perfect complement to the bitter greens and polenta. If you’ve never tried ricotta salata, it’s got a wonderful salty but mild and milky flavor. It’s great over pasta or salad as well. 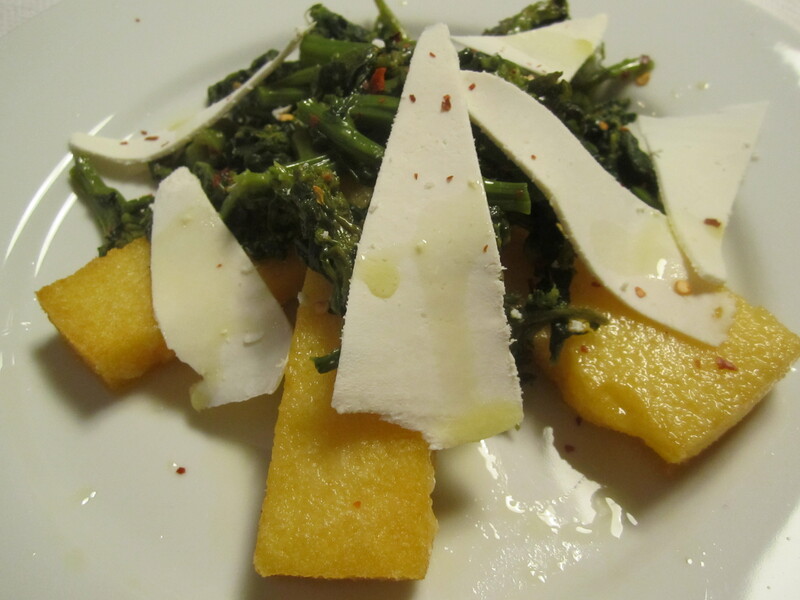 The greens and ricotta salata would go equally well over a piece of bruschetta or a bowl of pasta, for that matter, but try the crispy fried polenta sometime–this is a great antipasto–you can make the polenta ahead, cook the greens ahead and serve them at room temperature. the only last-minute thing to do is fry the polenta. In a broad skillet over low heat, saute garlic in 6 tablespoons olive oil until golden. Turn up heat and add broccoli, then cover. Cook broccoli over medium heat, stirring from time to time for about 8 to 10 minutes. Uncover and cook on high heat for another 3 or 4 minutes to allow remaining water to evaporate (add remaining 2 tablespoons olive oil at this time). Set aside. In a nonstick skillet heat 1/4″ of olive oil on medium heat. Brown the polenta until slightly golden on both sides. With a vegetable peeler, shave the ricotta over the entire dish and sprinkle with black pepper or chili flakes. Eat while hot.